The information presented on this page was originally released on March 25, 2004. It may not be outdated, but please search our site for more current information. If you plan to quote or reference this information in a publication, please check with the Extension specialist or author before proceeding. A tomato variety has charmed the Mississippi Plant Selections Committee to become the first vegetable chosen as a Mississippi Medallion award winner. This standout performer is the Mini Charm Tomato. It may be hard to believe, but a little 6-inch transplant is like a thoroughbred racehorse packed with vigor. The Mini Charm is a tall indeterminate variety. Indeterminate means it will grow, blossom and produce tomatoes throughout the growing season depending on climatic conditions. The continuous growth produces many main stems, all capable of flowering and producing fruit. Because of this abundant lush growth, caging or staking is recommended. At the Truck Crops Branch Experiment Station in Crystal Springs, those in cages reached 6 to 7 feet tall. In Mississippi State University trials, the Mini Charm produced 77 fruit to the pound and 1.5 pounds of fruit per picking. The tomatoes are sweet and delicious. If that is not enough to get you all excited, then consider the Mini Charm is an environmentally friendly plant in that it is disease resistant for Fusarium, Verticillium and Tobacco Mosaic viruses. The Mini Charm is a mid-season variety, meaning it will be only 75 days from transplanting to your first tasty fruit. Tomatoes need full sun and deep, well-drained soil. They require phosphorous, nitrogen, potash and minor elements. They are not fond of acidic soil, so you may need to add lime. Space plants 2 to 3 feet apart in the row and add a layer of mulch to deter weeds and conserve moisture. Feed with light applications of slow-release fertilizer every four to six weeks. 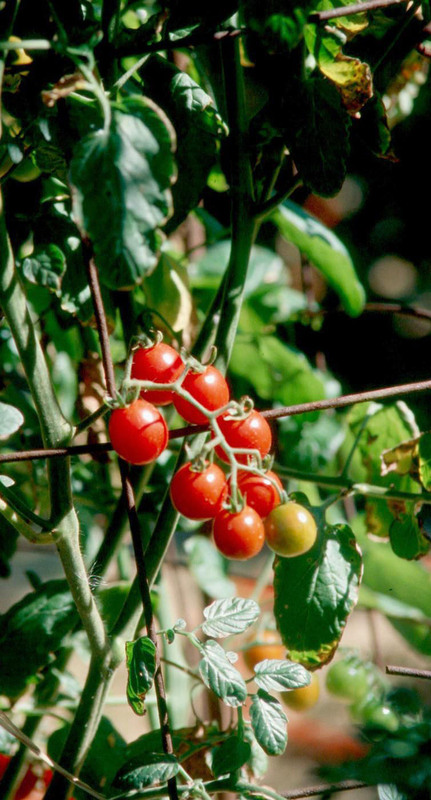 Maintain your harvest and you will be picking vine-ripe, delicious tomatoes until frost. Mini Charm tomatoes can easily be grown in containers, so don't fret if you have no garden plot. The container needs to be at least a foot deep with drainage holes at the bottom. I'll never forget seeing a friend grow cherry tomatoes in an old bushel basket on the patio table. His harvest was as great as mine was out in the garden. If growing in a container, use a water-soluble fertilizer about every two weeks, as you will more than likely be watering daily during the summer. We've come a long way since that day in 1820 when an audience gathered at the courthouse in New Jersey to watch Col. Robert Gibbon Johnson die from eating a basketful of tomatoes. Johnson's physician warned he would, "Foam and froth at the mouth ... double over with appendicitis ... and expose himself to brain fever." Johnson didn't die that day, and a new era for tomatoes slowly began. Today, the tomato is the No. 1 vegetable grown not only Mississippi gardens but throughout the United States. The Mini Charm will surely add to its popularity. The Mississippi Medallion program is in its eighth year and is sponsored by the MSU Extension Service, the Mississippi Nursery and Landscape Association and the Mississippi Plant Selections Committee. Look for the colorful point-of-sale material directing you to the Mini Charm tomato at your garden center.